*I went through all of the cards we just received in December (and even found the stack from 2017 – Yikes!) and updated addresses and the list of people we send to. *I saved a couple pictures of friends and family for our refrigerator and put those up. *I also saved the fronts of some cards – ones that were blank on the back – to use as note cards this coming Christmas. *I recycled the rest of the cards and envelopes. *Next, I spent some time thinking about what kind of card or letter I’d like to send this December and made a note of that. *And lastly, I added our most recent Christmas letter to our Christmas album. I began this album the first year we were married and we now have a wonderful keepsake to look back at each year. 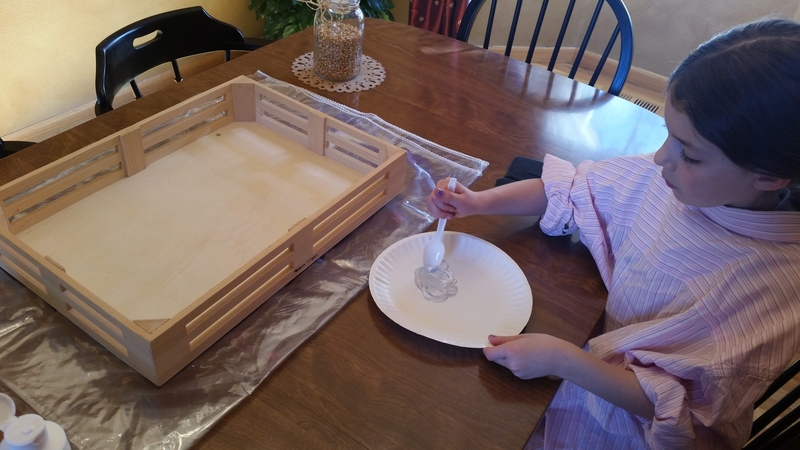 Tray: Last summer I wrote about wanting to paint an old wooden tray to use for tea times with the kids in my bedroom. Last fall Anna helped me paint it, and this month I stumbled upon a wall decal that I wasn’t using and added that to the tray. It looks great! I used it twice this month with the kids individually – to have a brief time for them to talk, pray, and discuss whatever is on their hearts. We made toast with cinnamon and sugar and mugs of tea and headed upstairs. It was simple and easy and I think will be a wonderful avenue to hear their hearts in the coming years. Plan to have friends over: James & Anna both invited friends over last week to play. As I mentioned in the last post, James likes to call it a hang-out rather than a play-date. Much more grown-up sounding. Lately we’ve had several conversations with the kids about hosting friends and being invited to other’s homes. We are rarely invited to other kids’ houses to play and hang out and the kids have been discouraged about that lately. I think most families are just very busy and never get around to inviting others over. The kids don’t mind inviting friends to our house, but it’s also fun going somewhere else to play once in awhile. We talked with James and Anna about ways to make our house more fun to play at with friends. Can mom make cookies every time we have friends over? Can we better use the space in our basement to make areas to do things the kids are interested in? Yes and yes. I’ve found that keeping frozen cookie dough balls ready to go is the answer so I’m not making cookies from scratch each time. And, months ago we cleaned out our basement – got rid of the things we weren’t using and the things we were storing for others. That’s when the kids and Kenny decided to build a stage in the basement. We now have James’s drum set there and Anna’s microphone. They’re also planning to hang some lights soon that will aim towards the stage. James and his friend, Laila, played on the drums for such a long time the other day. The stage somehow makes the drums even more fun. We also set up a dance game with an old TV in another area so the kids could play dance competitions with each other. The pool table will slowly become something the kids want to play more too. These things so far have been wonderful decisions to make the kids more interested in having friends over. Kenny and I see great benefit to being the “fun house” as the kids grow. You know – the house where all the friends want to go. The motive is not to show off all the “stuff” but to be involved in the lives of the kids and their friends – to know them, to know what they’re interested in, to provide places for them to play, hang out, and talk together, and to be a safe place for their friends to come. We don’t want to hover, but do want to be available for any of them to come to while they’re here. I’m praying that James & Anna will continue to want to bring friends home in the coming years. As a side note, I am really enjoying reading the One Year Bible that I mentioned at the new year. God is so faithful as the generations continue on. Yesterday I finished Genesis and loved reading from Adam, to Abraham, Isaac, & Jacob, and on to Joseph and now Moses. I’m thankful for this renewed motivation to get things done. A few goals for the month is so much more doable! Here’s to persevering throughout the year! Have you accomplished some things this month that have been on your list for awhile?